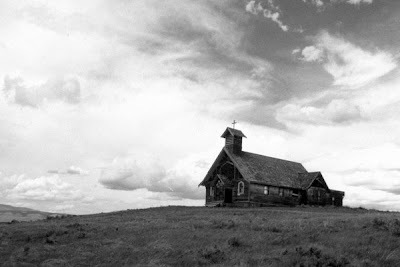 Highway 89 is my favorite north-south drive across Montana, and here's a photo of my favorite landmark among the way. This is the old St. John's Catholic Church in Ringling, resting atop a little hill overlooking the dying town. It's been decades since the church saw regular use, and when I took this shot 15 years ago the place was looking pretty rough. But people have been taking more of an interest in the building since then, and today it's looking sharp with fresh paint and a new roof. I'm very glad the church is being taken care of, of course ... but still, I have to say it looked way more atmospheric back then.